Arles is a remarkable French town located in the Provence in the southeast. It is is situated on the Rhone River, north of the Camargue and the Mediterranean Sea. Because of its many important historical monuments that form a unique urban atmosphere, Arles was listed as a UNESCO World Heritage Site in 1981. Centuries of medieval buildings, the Roman arena and the treasures found at Arles attract tourists from around the world. The best time to visit this French town is during the summer months. At this time of the year there are many interesting organized events such as bullfighting and chariot racing in the Roman arena. The best way to get to Arles is by train from Marseille, Avignion, Montpellier and Nimes. This trip allows you to see many beautiful places in France.The final destination before reaching the Mediterranean is Arles, which has been hidden away since Roman times. In the first century BC Julius Caesar conquered Marseille and Arles became part of the Roman colony. With great pace, the colony became one of the main towns in the region and an important commercial centre. Throughout history Arles derived much benefit from its strategic position on the Rhone River, which was a major trade route in France. After the collapse of the Roman Empire, Arles gradually loses its importance and perhaps this is one of the main reasons its magnificent historical antiquities are so preserved till today. Arles regained political and economic importance in the 12th century by the Holy Roman Emperor Frederick Barbarossa, who arrived here in in 1178 for his coronation. 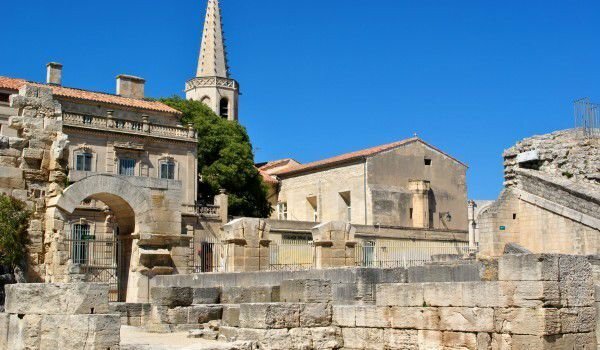 From the 12th century to the French Revolution in 1789, Arles had the status of a free city. Perhaps the most important landmarks of the city are the Roman amphitheatre and necropolis "Alyscampes". The old theatre can hold 20, 000 spectators and is now used for various concerts and events. Here was found a painting of Venus, which is now kept at The Louvre in Paris. The magnificent Roman arena, holds about 12, 000 people and dates from the end of the 1st century. In the eighth century, the arena was turned into a fortress, but today its towers are all that remains of that era. Church of Saint Trophime, which was previously cathedral is an important representative of Roman architecture and sculpture for a fine example from the 12th century. The image of Judgement in the main entrance is typical of Roman sculptural art. It has been restored with international participation. On the walls of the temple can be seen hanging beautiful tapestries. In the galleries you can see unique carved columns. Each year the town hosts photographic festival. The painter Vincent van Gogh moved to Arles on February 21, 1888. Here he created over 300 paintings and drawings. Many of his most famous paintings were completed here including Night Cafe, Yellow Room, Starry Night and L'Arlesienne. But none of his work remains in the town today.